These principally consist of chlorophylls (green), anthocyanins (red to purple & blue) and carotenoids (yellow to orange & red). Anthocyanins are water soluble, the others are not, and are naturally occurring pH indicators changing colour as widely seen in hydrangeas. The red and yellow autumnal colours of some trees and plants are caused by the chlorophylls breaking down and increasing amounts of anthocyanins & carotenoids being produced. Some flowers are thought to be able to emit light. Possibly some Passiflora can do this. There are actually two very similar chlorophyll molecules, a and b, which overlap in the light wavelengths they absorb. As the light wavelengths change in autumn however they work less well and so the other pigments increase. The changes to lighter colours allow plants to get a bit more energy out of the dying (senescent) leaves before they drop. 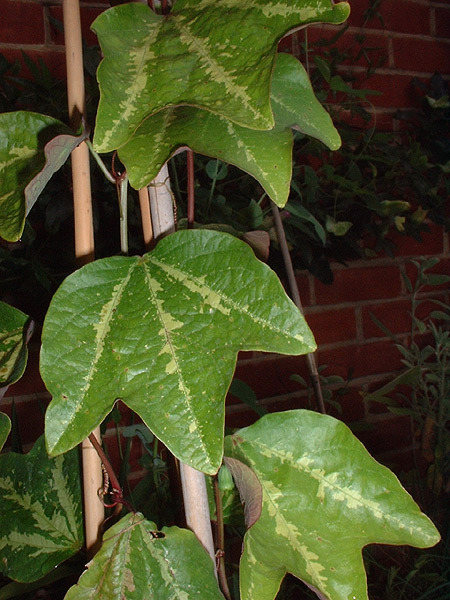 Most Passiflora drop their leaves over winter as the amount of energy required to stop them freezing (think large thin tropical leaves) is more that their potential energy return under low light levels. In contrast conifers don’t drop their leaves as they have adapted their leaf shape to a needle, easier to keep warm but gives less energy return in summer months. Some Passiflora species like P. actinia (thick single lobe) and P.caerulea hold their leaves to well below freezing. Dr Roland Fischer’s new caerulea tetraploids have thicker more leathery leaves and so hold them even better over winter than diploid caerulea. The end point of leaf dropping is that of Passiflora such as P. incarnata and P. lutea which are totally cut back to the ground at the first frost & do not reappear until after the last frost the following year. What is remarkable is that other Passiflora such as P. caerulea which are not exposed to very harsh winters in their native South America can also regrow from the roots when grown under more severe conditions elsewhere.